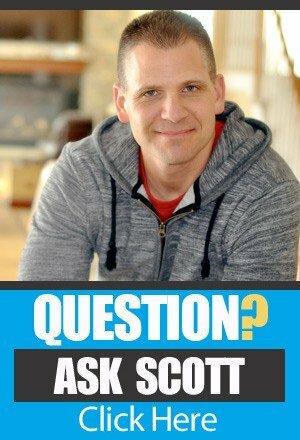 Are you fired up and ready for another awesome session of Ask Scott here on The Amazing Seller podcast? 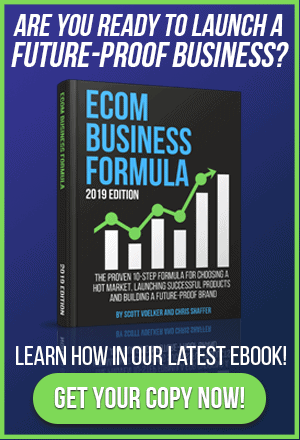 This is your place to get the motivation, energy, and excitement you need to push through the tough parts of getting started in the ecommerce arena. 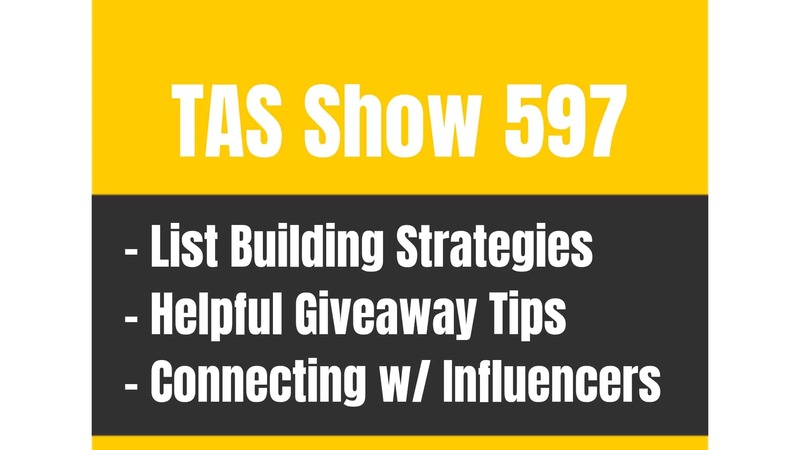 On this episode, you’ll hear from Scott as he announces the winners of the Private Label Classroom scholarship giveaways and of course, as always, he’ll answer questions from sellers like you! What are you waiting for? Make sure to listen to this episode and use it as fuel to TAKE ACTION! Where are you in the process of running your own ecommerce business? Seriously? What steps have you taken to get closer to your goal? Some people will take HUGE steps to accomplish their objectives while others need to take small steps along the way. Which one is the right fit for you? On this episode of The Amazing Seller, you’ll hear from Scott as he encourages sellers like you to stop listening to your internal excuse and decide to just start! Sometimes you need that strong and forceful voice that compels you to take action! That’s what Scott is here to do. Listen to this episode to get the inspiration you need to get started today! Is China the best place for product sourcing? What about the US and India? Are you at the point in your process where you are looking for sourcing for your product? Have you done your research and looked at the typical options in China? What about sourcing your product from the United State or India? Are these good alternatives to using manufacturers in China? On this episode of The Amazing Seller, Scott shares his thoughts on this subject. Scott says that if you can find a manufacturer in those countries and still make a decent profit, then go for it! He also touches on a trend he has seen with sellers who get a mold made in China then have it sent to the US or elsewhere for the actual production. To hear more about this topic, make sure to catch this episode! Could the use of 3D printing be a game changer? With the rise of 3D technology and other amazing innovations, how will this affect the ecommerce marketplace? Is it a good idea to start experimenting with 3D technology and start making products from home in that manner? On this episode of The Amazing Seller, Scott opens up about 3D printing and if sellers like you should look into it. Scott encourages sellers to go for it and experiment with creating 3D printed products. Why not? If it’s a resource you have access to and you have a good idea to test, then go for it! To hear more insights from Scott on subjects like this one, make sure to listen to this episode! [2:00] Shoutout to PLC winners! [7:30] Question #1: Is it a good idea to source products from India or the US? [11:00] Question #2: What are your thoughts about 3D printing products? [15:30] Question #3: I’m trying to modify a patented product, is it worth it? …is sourcing outside China. I get that question a lot. We’re going to address that today on the show. We’re also going to talk about 3D printing as far as products go, what it is maybe even if you don’t know what it is, and then utility patents. We’re going to discuss that a little bit also and just dig into those topics. All right. Now, if you want to get in on this conversation, and what I mean by that is when we’re sitting around this coffee table and that’s kind of how we talk like about this Ask Scott session. I want to feel as though we’re at the table together and we’re just kind of bouncing ideas off each other and just dig into this business stuff really. So, if you want to sit in on that table and have your question answered or if you want to ask your own question, head over to TheAmazingSeller.com/ask and you can do that. Just record a short message of your name or where you’re tuning in from, not where you’re coming from, where you’re tuning in from and then from there just a brief question and then I will do my best to air it here on an upcoming show. All right. The other thing is the show notes to this episode can be found at TheAmazingSeller.com/454. [00:02:05] Scott: And we did that, and we had two winners out of about 20 entries and they were all great and it was probably one of the hardest things I had to do here recently. But we did narrow it down and we are going to announce them right now. You ready? Let’s go ahead and give a little shout out here. So, number one, the number one winner or the first winner that is, is Tie Johnson. So, Tie, if you’re listening, you probably already know but I’m announcing here publicly to give you a little love, a little shout out. Tie is a 20-year-old kid. I’m going to call him a kid because if you’re 20 years old, to me you’re a kid. I’m 45 but I remember when I was 20 years old. I remember not going to college. I remember working straight out of high school and you guys know my story if you guys have listened for any period of time, you guys know that’s my background. It’s where it came from. Well, Tie is actually a heavy equipment operator and his story really resonated with me and he’s a hard worker. He’s already launched a couple of test products, done pretty good with them or good enough to say I’m doing this and I’m actually making a return back on my investment but he’s learning, and I want to kind of mentor him because it kind of reminds me of myself. So, that’s what really resonated with me with Tie and that’s why I wanted to do that for Tie. So, Tie Johnson, congratulations, and everyone let’s hear it for Tie. All right. A little applaud. The other winner was Sue Ritchie. Now, Sue had sent the video in of her explaining that I believe it was her or her partner, business partner, was in either a brick-and-mortar and then she was in sales or it was the other way around, but they came together. They started listening to the podcast. They launched a product or two and now they want to take the business to the next level. And the one thing that was pretty cool with all these stories is and not even just the two that we picked as the winners but most of them had already gotten started which I love that. It just means that you’re doing something. [00:04:02] Scott: And if you guys haven’t been listening the past couple of weeks, then you got to go back and listen because the theme that I’ve been really talking a lot about is just doing something like you hear me all the time saying #JustStart like just start, like do something whether it’s consulting, whether it’s just taking a product and putting it up there just to learn the process. Doing something. Well, most of these people that have submitted had already started and I love that because a lot of them want to go back and they want to go through product research, again, which I think you never really master. I think you have to keep just mastering your craft and kind of like just honing it and that’s what they want to do. I know Tie has already launched or Tie had already launched some products, but he wants to go back and kind of start from scratch with broadening out the brand maybe. Sue, same thing. So, those are the reasons why I picked them. They had some really great stories. It resonated with me for a couple of different reasons but one of the main things is that they are doing something and not to say that not everyone that’s listening isn’t doing something. You probably are and that’s awesome. But I want to really inspire and motivate you guys to get out there and do it like a lot of people are but there’s a lot of people that aren’t. Okay. So, you need to decide what are you going to do? Are you going to sit here and just keep consuming information and then not do anything with it? Or you’re going to consume the information, do something with it, get a result, and then learn from that experience? That’s what you really need to do. You have to almost think of this as though you’re going through a college program. You paid a lot of money to go through it and now you need to stick with it and go through the course. That’s what you need to do. You need to go through the class or one of my listeners and actually someone I just had on the podcast, actually, he hasn’t been on yet, I recorded an interview, but he calls it private-label study. It’s kind of like where you’re just consuming this information but then you’re applying it in real life and seeing what happens and that’s what I want you guys to do. So, at this point I want you guys to just do something. [00:06:02] Scott: Now, I had Kathleen on recently. Kathleen Eberhardt, I think that’s how you pronounce her name. I’m sorry, Kathleen, if I messed that up. 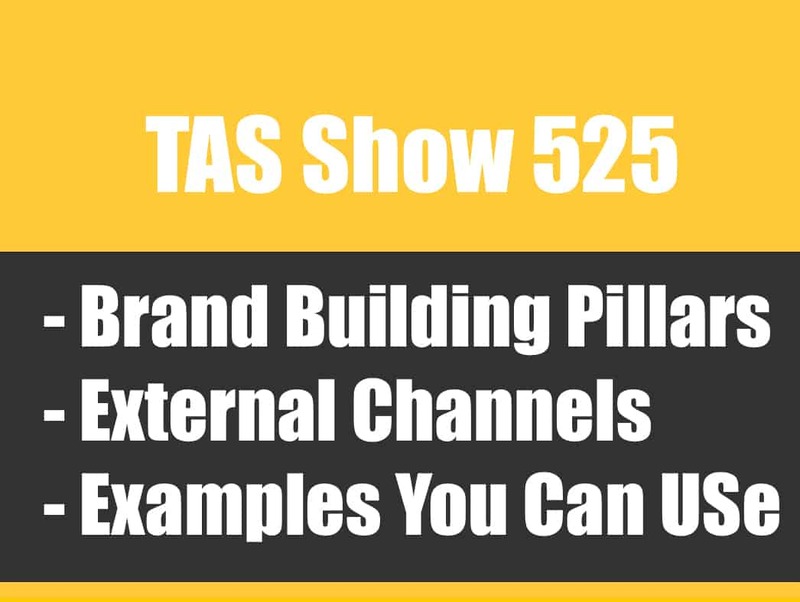 But that was episode 453, the episode just before this one, and we talk all about her starting by helping another business. So, she didn’t have a product. She didn’t have the funds, but she went and helped another business and learned through that experience. Now she’s consulting other businesses and that’s a way for her to still tap into this Amazon business and this e-commerce business and then from there when she wants to, she can launch her own brand when she’s ready. So again, I just want you guys to see there’s more opportunity here than you might be even aware of. So, that’s a great episode, guys. If you haven’t listened to that one, do that. And before we move on to today’s first question, one last thing. If you are having trouble getting started because, well, you just don’t have the roadmap. I have the roadmap for you. Head over to TheAmazingSeller.com/start and that’s the only place you should be right now. Go through that. I have a five-part series on the podcast here that you can go through and depending on when you’re listening to this, I also have a compressed version of that on our workshops and that can be found at TheAmazingSeller.com/workshop. 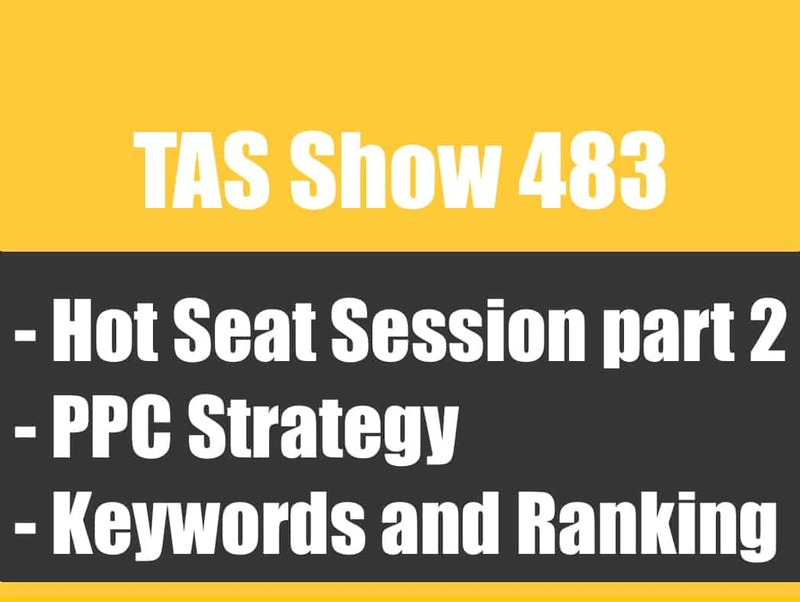 I know I’m throwing a lot of links at you guys, but these are all free resources and you can go to the show notes page of this episode and grab everything which is episode 454. All right. So, I’m going to stop talking so we can jump into today’s first question. Let’s get going here. What do you say? Let’s do it. [00:07:35] Guy: Hi, Scott. My name is Guy and I’m from Israel. I’m in the product selection phase. First, let me thank you for a great podcast for all the good energy that you spread. It really comes through all the way over here to inspire and motivate. My question is about sourcing. Everyone talks about sourcing from China. What are your thoughts about sourcing from India and sourcing from the US? [00:07:56] Scott: Hey, Guy. Thank you so much for the question. All the way from Israel? That is just amazing, and I think you guys have heard me say this a lot. Whenever I get an international listener and we get to talk in a sense, it’s pretty crazy. It’s pretty awesome and I feel so blessed to be able to connect with all of you. So, thanks for submitting these questions from all over the globe. I really truly appreciate it. Okay. Guy, let’s dig in here real quick. A lot of people think that the only place that you can go is China because that’s what we talk about. Some people say, “You know what, I want to do whatever I can to not source from China just because I don’t want to buy product and sell it from China. I want to do it in the States,” and that’s great. If you can do it and if you can make money doing it, go for it. More power to you. Now I know some people what they’ll do is they will go to China. They will get the mold made because the mold cost will be less and then they’ll bring it over to a manufacturer here in the states so that’s another option. [00:09:59] Scott: Good. Great. Then go to work and start googling and start reaching out to manufacturers that can do it here in the States and try to come up with a way that you can do it here locally in the States. Okay. That would be my answer. So, the answer is, yes, you absolutely can, and you just have to figure out where they are. A great place to start is Alibaba and then just specifically target that country or just do a Google search. Use our friend Google here. It might take a little digging but, guess what, if you find a product that took you a while to find the manufacturer, it’s going to be a really, really good for you because it’s going to take other people longer or maybe not even be able to find it. So, think of it that way as well. So, the answer is yes, you absolutely can. And I would suggest it if you can, to differentiate yourself or at least making it a little bit harder for other people to find that product. But if you have a resource there, go for it, go for it. So, let’s go ahead and listen to the next question and I’ll give you my answer. [00:10:57] Michael: Hey, Scott. My name is Michael and I really love your podcast. And I was thinking about a new area which maybe to explore. So, if you could 3D print plastic objects and then sell them on Amazon, that could be some interesting. If you can make money out of that then it seems to be quite cheap and easy to do. Have you ever thought about 3D printing? I would like to hear your thoughts and so on. Remember, Scott, that you’re awesome. All right. Have a good one. [00:11:33] Scott: Hey, Michael. Thank you so much for the question. Again, it sounds like another international listener and, Michael, I’m sorry I’m not sure where that accent is from. I don’t even want to try to guess because I will sound silly. But I love it. I love it. Okay. So, Michael, thank you so much for being a listener and I’m glad that you’re getting value. And I’m glad that you ask this question because I think that if you have a resource or if you want to even play into 3D printing arena, I think that’s really good. I think that’s really good because it’s going to allow you to be able to create a product from scratch in a sense and then from there, sell it as test orders. Okay. Now, there was someone, gosh, going back about two years ago, and I’m not going to say the product, but they were creating a 3D printing of this product. They were printing them themselves. The husband was into like a model design and all the 3D renders at all that stuff like – not renders. I don’t even know what I’m saying here in the 3D market but basically where they can take something, create that in like a software that allows you to make a 3D printing thing, and then from there he was able to do it himself. So, she came up with the idea. He brought it to life and then they printed it. Now, for them, it was a slow process because what they would do is they would – well, I say slow process. It was slow in the sense that when they wanted to print out 50 the products, it was taking days. So, it wasn’t like you had a mass production thing going on here. But with that being said, if they did that on a variety of different products and then they wanted to source it, it’s going to be a lot easier. Sometimes you just have to hand over the 3D printing to the people and then they have a mold made and then you’re off to the races. Now, some people would say, “Well, where do you find this type of people?” You can find them. [00:13:30] Scott: Go to Upwork.com and just look for people that do 3D printing and then start that conversation. Maybe they will lead you to another outfit that will do the custom 3D renders for you and all of that stuff, whatever goes into it. But that is definitely something that you could be looking into. And if you already have that in your arsenal like let’s say that you already have a connection there, go for it. Again, that would be like a partnership maybe. Maybe you say, “Hey, listen, I’ll come up with the ideas and then we’ll put our spin on it. You go ahead and do all of the graphics stuff for it, so we can do a 3D printing,” and then from there, you guys are partners now. So, he’s got a skill set or she’s got a skill set and you do and then you come together. That’s a great partnership. But again, I’m not saying you have to partner. I’m just saying it would be. You always look for these different things. So, with that being said, I think it’s a great idea and for some people, it’s going to be easier than others but if you can do it, it’s a great thing because, again, you can bring a product to market very, very quickly. Yes, you might have to get some boxing made. You might have to have some boxes created. So what? That’s easy. That’s not a hard part. I mean, for starters you just go to Uline, get some generic boxes and have some labels printed and put those on there, I mean, if you just wanted to get started that way or you can go to a company and have some boxes printed and then you just have to put them together. Yes, it’s a slower process as far as like you can’t bang out 1,000 units but you’re going to be able to take a product from nothing to something and then launch it, get a result, see what happens and move on. And then from there if it works, obviously, we’re going to want to scale that. You’re not going to be printing them at home. At least I would hope you wouldn’t be. All right. So, hopefully, that answers your question. Sorry I didn’t refer to the terminology. I don’t know the terminology, so I did my best. All right. So hopefully I did it some justice. So, great question and I’m glad that you asked it, Michael. So, let’s go ahead and listen to one more question. I’ll give you my answer. We’ll wrap this baby up and you guys can get on with your day. What do you say? [00:15:36] Dan: Hi, Scott. This is Dan from Northwest Indiana. I’m just about 30 miles Southeast of Chicago. Been listening to the podcast for quite a while. I have been doing Amazon, started out with retail arbitrage and have been private labeling for the last two years now. My question is many times, well, they say to try to find a product and improve it. I think I’ve done that. Now, the person says they have a utility patent on the product and I’m not sure what to do. I wonder if you could give some insight on that. I have changed the shape of their product. Yes, it does the same thing, but I’ve improved the product. So, if you could let me know what else I need to do. I hate to spend some money on a patent attorney. It’s not that good a product. Should probably just let it go. Thank you, Scott. And I’ll listen for your answer. Well, I think you just answered your question. Number one, you’re going to have a lot more headaches and I think there are other products out there you could probably work with that won’t give you as many headaches as far as patent stuff and trademark and infringements and claims and attorneys contacting you and battling with that because you’re going to make 25% margin when you should be making 35 or 40 or even a 50. So, I don’t think you should go down that route. With that being said, maybe you do see that there are profit margins that are higher once you get rolling, once you buy more and stuff and you’re like, “You know what, if I was able to do this, I think it would work,” then I would say then invest in a patent attorney. I mean, the only way you’re going to know if you have a chance at even avoiding any type of court fees or lawyer fees or anything like that after you get a claim against you is to really contact a patent attorney and ask them their opinion. But one patent attorney told me probably about a year ago now that even if they have a patent pending and they have a lot of sales coming in and you don’t have any sales coming in, they’ve got more money to fight you. Right? [00:18:41] Scott: So, if they have that money coming in, they will be willing to fight you especially if they see growth and if they see that you’re infringing on a patent even though you think that you made a tweak and it’s not the exact, on a utility patent, it’s not the same design and you’ve kind of tweaked it a little bit. But again, that your item that you may think is patentable, it might not really be because it’s too close to the other one and you wouldn’t know that until you started filing through the patent process which from what I’m gathering is not always an easy process because they’re going to come back and say, “No, it’s too close to this one. You got to go come back and do something different,” and then you got to adjust something else or maybe it’s the fabric or maybe it’s the texture or something like that. So, because of that, I would stay away. I’d run myself. I don’t want to get cease-and-desist letters. I don’t want to get patent infringement letters. It’s just something that’s going to take away from you growing your own brand. I think there are enough out there, enough other products that you could do without infringing on a patent and then going down that whole road. So, I would say, again, sitting at that coffee table you and I having that cup of coffee, I’d say, “Dan, walk away, man. There are other products you could be doing.” And I think you already know that answer. I think you kind of answered that. I think you just want a little bit of confirmation from someone else and that would be my advice. I would stay away. If you think that there is a chance, then hire a patent attorney. A patent attorney is probably going to cost you $300, $400, maybe $500 to give you, I guess, some advice but again even if they give you advice, it doesn’t mean that it’s 100%. It just means it’s their advice. They may say, “If it was me, yeah, I think we could fight it and, yeah, I go for it but if you’re not willing to spend $10,000 on lawyers’ fees, you might not want to do that.” Heck, for $10,000 we can go launch another product. So, I think I’d stay away. Anyone else that’s listening that might be thinking themselves, “Oh, if I just make this one little tweak, I think I’ll be okay,” I’d walk away. So, that was one. And then we had another one that we were going to launch that was actually more of a trademark and then I just backed off. I said, “I’m not going to go down that road,” and then one most recently was one as well and, again, I said, “If we can’t make that thing like completely different where there’s no confusion then I’m not even going to do it.” There’s plenty of other products that we can launch and not just have to launch that one and get into a whole lawyers and all that stuff. So, we don’t want to do that. So, anyway, I know I’m rambling here a little bit, but I just want to make sure I’m clear. There’s a lot of other opportunities out there that you don’t have to go down that road and I would probably stay away. I could sleep better at night. I don’t want to wake up to be wondering, am I going to get that phone call? Am I going to get a letter? I don’t want to go down that road. All right. So, I think that’s going to wrap it up. I mean this is pretty awesome, guys. We’re at that 140 sessions right now of the Ask Scott. I mean it’s 140 weeks which is amazing and I’m not going anywhere. Now the next episode depending on when you’re going to listen to this is episode 455 and that is going to be on Christmas day. [00:22:45] Scott: Now, I’m not going to be recording on Christmas day but I’m going to record one beforehand and I’m going to give you guys a little special episode where I’m going to give you my gift to help you succeed. So, be on the lookout for that one. You don’t have to listen to it on Christmas Day. It’ll be there. Enjoy your family. Enjoy time with your friends and just enjoy some time to relax. But if you did want to tune in, it will be there for you because I don’t want to get off my routine of Monday, Wednesday, Friday so I’m going to be doing an episode. It won’t be that long. It’ll be probably around 25 minutes probably. I don’t know exactly. I’m just going to tell you what I need to tell you and then I’m going to let you guys go. But definitely that one there is going to be just a little episode that’s going to give my gift to you to help you succeed. It’s really important that you understand that I’m here to help you succeed now and into the future. I’m not going anywhere, and I want to do my best to give you the resources and the motivation to get out there and do it and I hate using that word because a lot of people are like, “Oh, you don’t want to be that ra, ra. Everything’s perfect,” and I’m not that guy but I am a guy that believes that we all have choices and if you want the lifestyle of being able to create your own schedule and live where you want to live and all of that then I think you have that choice and I think you can do it. And I think this is a great business model to get you involved in the online space whether that’s where you’re going to end up. I can’t say that, but it will get you started. And from there, we can get some momentum and we can start to get you moving closer to where you want to go. All right. So, all right, guys. So, that is going to wrap it up. I want to remind you the show notes to this episode, TheAmazingSeller.com/454. I have all the other links there for you. The one important one is TheAmazingSeller.com/start. Go there, start consuming that if you haven’t done so already. [00:24:43] Scott: That is your five-step private label roadmap all laid out for you. There are five episodes of the podcast there and I have them grouped nice and neatly on that blog post over at TheAmazingSeller.com/start. All right. So, guys, that’s it. That’s going to wrap it up. Have an awesome, amazing day and remember, as always, I’m here for you, I believe in you, and I’m rooting for you, but you have to, you have to, come on, say it with me, say it loud, say it proud, take action. All right, guys. I’ll catch you later. Have an awesome amazing Christmas if I don’t talk to you until after. All right. Take care. 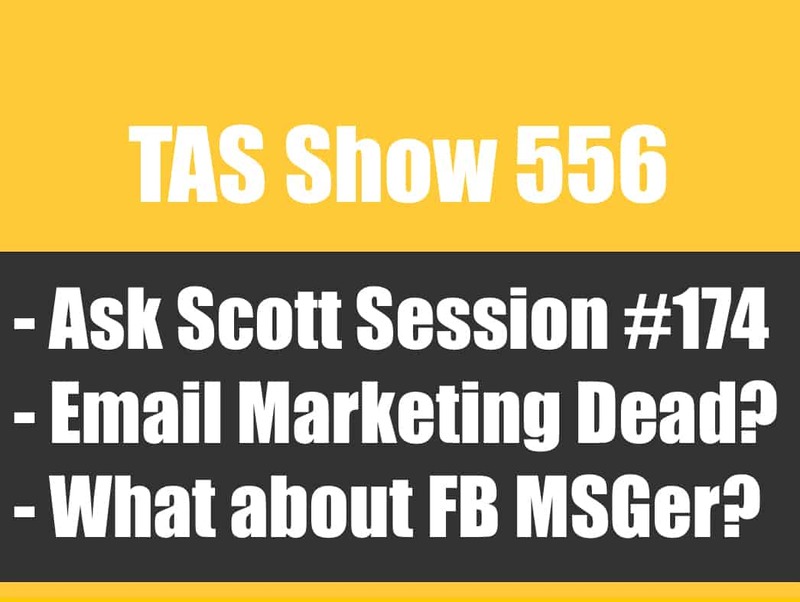 TAS 556: Ask Scott #174 – Is Email Marketing DEAD and Should I Still Build a LIST?